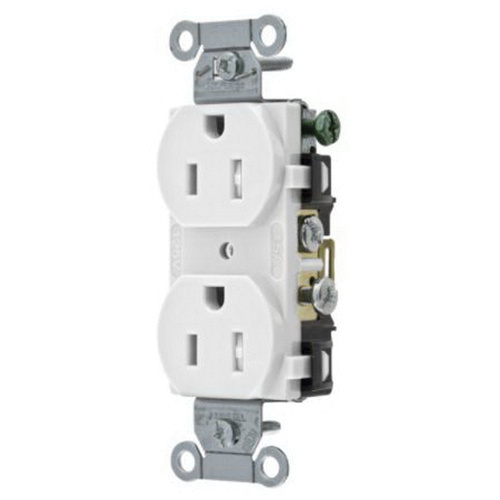 Hubbell-Wiring 2-Pole 3-Wire Heavy-duty straight blade duplex receptacle in white color, has voltage rating of 125-Volts and current rating of 15-Amps. It has a dimension of 1.569-Inch x 1.147-Inch x 3.281-Inch. It offers side wired terminal connections. The commercial specification grade duplex receptacle has dielectric strength of 2000-Volts. It accommodates conductor of size 14 - 10-AWG. It features nylon construction, galvanized steel strap and brass contact. It has maximum load capacity of 1/2 hp. It has temperature rating of -40 to 75 deg C. Duplex receptacle is UL listed, CSA certified and meets Federal specifications, NEMA standard.